Much like the Sydenham Street Methodist Church, this was an important site for immigrants as it was one of the few churches that welcomed immigrants and actively recruited them. Yet this recruitment did not always work. 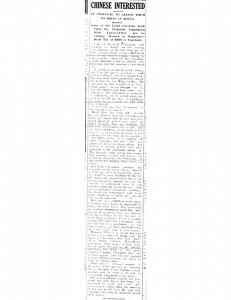 In 1901, attempts to engage the Chinese community failed, and church documents state that the church’s efforts with Chinese immigrants were “not successful”. However, by 1923, the situation was remedied and the Chinese community actively participated within the church. This evidence shows that the Chinese community did exercise control in determining their integration into the host community. This integration occurred based on mutual understanding when both parties were willing. Alongside their international missions, St. Andrew’s has had a long history of carrying out Christian missions to recruit members from the Chinese community to join the congregation and participate in church activities. These missions usually occurred under the auspices of the Women’s Missionary Society who would actively seek out members of the Chinese community and enlist them into the congregation. These Christian missions were most active in 1960 and 1961. The Women’s Missionary Society’s published reports in their bulletins under the title of “Chinese Work”. This push for assimilation is evidence of Kingston”s integration mentality when dealing with newcomers from China and other parts of Asia. The way that the Chinese became a part of St. Andrew’s demonstrates the manner in which integration occurred between the Kingston community and the Chinese immigrant community. Integration of the two communities was not merely determined by the Kingston community. The Chinese themselves played a large role in determining the timing and extent of their integration. In this way, the formation of Kingston’s Chinese enclave was a mutual construction. Many groups and people in the Kingston community were eager to “Canadianize” the Chinese immigrants and assimilate them into the community. The Sydenham Street Methodist Church and St. Andrew’s were notable for their active recruitment of members from the Chinese community. Chinese associations such as the Chinese Nationalist League (CNL) also served as a place for integration. Non-Chinese participation was encouraged in the CNL and non-Chinese members played a documented role in the organizations administration. As previously mentioned, Kingston’s Chinese community consisted almost exclusively of men. This was a phenomenon that was experienced in other Chinese communities across Canada. Kingston’s Chinese population totalled three male immigrants in 1891 but quickly grew, and by 1921 it had reached ninety-six. However, even after thirty years there were no female immigrants of Chinese origin in Kingston. One of the reasons why it remained a bachelor community was because marriage between different ethnicities was not seen positively. 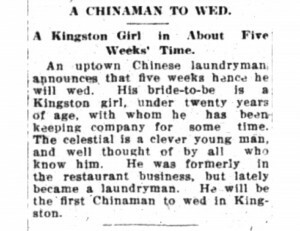 In 1912 a Chinese laundryman named K.P. Sam tried to marry a young Kingston woman that worked for him. Although he had the approval of her father as well as a license to get married, no priest would marry them. 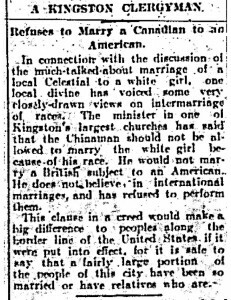 One priest, who was quoted in the Daily British Whig on November 15, said he would not marry them because he did not believe in interracial marriage. Interracial marriage did occur later on in the 20th century. In the 1940s, William Lee married Mary Vellequett, a French-Canadian from Cornwall. Their marriage resulted in four children, two sons and two daughters. Photographs of the reception at the Roy-York Cafe show a crowd of both Chinese and non-Chinese, who appear genuinely happy and accepting of the couple. Paul Seto, manager of the Plaza Cafe, also married a non-Chinese woman in Kingston. There are many other examples of interracial marriage that can be seen as evidence of the extent of Chinese integration into the Kingston community. The first female Chinese resident of Kingston arrived in March 1923. This was Mrs. Lee, the wife of Peter Lee, who arrived shortly before giving birth to her son Victor Peter Lee. The lack of female Chinese immigrants was the result of federal government restrictions on Chinese immigration. Kingston’s Chinese community continued to be dominated by males through to 1941. At that time, Kingston’s population of female Chinese had only marginally increased with the census recording eight females. This shortage of females had a large impact on the community. The Chinese community was negatively perceived by the public because of its lack of female members. Another dramatic effect was seen in the birth rate within the Chinese community. Even by 1971 more than 60% of Chinese in Canada were foreign born. The impact of World War II on Canada’s Chinese population was significant. In 1941, with the Japanese attack on Pearl Harbour, the war spread to the Pacific Ocean. As a result, China became an ally of Canada. Chinese-Canadians supported and contributed to the war effort in both their former home and their new country. Due to their new alliance, public perception of the Chinese in Canada improved dramatically. During the war, Kingston’s Chinese community also experienced growth in their businesses and afterwards Kingston’s economy improved and the city witnessed expansion. Many Chinese restaurants were part of the expansion and moved west, away from the downtown core. Many chose to move closer to the highway in order to attract new customers coming through Kingston by car. Businesses also began to feel less of a need to hide their Chinese heritage and over the next few decades many restaurants began advertising and promoting their Chinese ownership, as opposed to hiding it during the pre-war years.